If you had told me I’d be writing about community focused, insect-based, plant-based, gut health products seen at the Fancy Food Show, I’d have asked if you meant Expo West instead. But no, this is the 2019 Winter Fancy Food Show. The Three C’s for which WFFS is known for: chocolate, cheese, and charcuterie are still abundant. You’d think that the presence of probiotics and the “good for you” fare of Expo would be a welcome addition as a show-goer. Instead, indulging in samples of luscious chocolate to roasted crickets left me with more than the usual post-show indigestion. Certainly there was a lot of “new” and “interesting” at Fancy Food and the emergence of these healthier products on display reflects the shifting retail landscape where ‘gourmet’ could mean BFY as much as it means “truffle-infused.” Looking beyond that though, what was going on? Below are the 3 things that made us go “hmm” at this year’s show and the implications for your business. Argania promises it pays a fair living wage for the production of its oils and butters. A long-successful marketing tactic has been to promote alliances to charities or other key communities to provide support. These were often large-scale, national organizations, which made it hard to envision the individual that’s impacted, which means it’s a steeper curve to build empathy and be compelled to take action, i.e. buy the product. Several companies were promoting the micro-communities that contribute to their business. Small Axe Peppers works in partnership with local community gardens in Queens and the Bronx to grow the peppers that are used in their hot sauces. Each hot sauce is named for the community from where it comes. 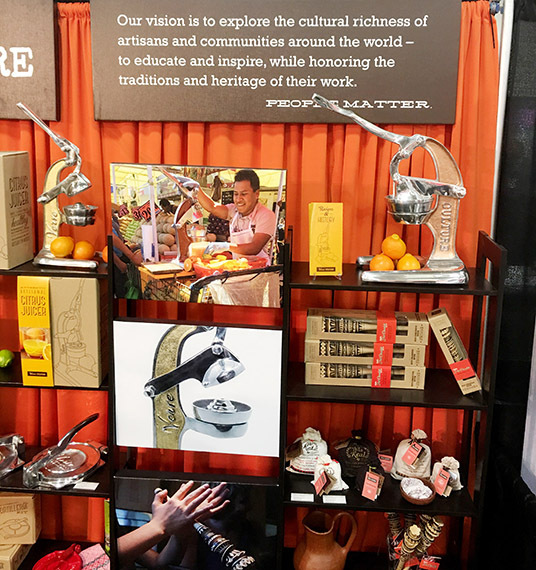 And Verve Culture works with local communities and cultures to bring products that are culturally relevant to the marketplace. How local and individual can you go? Profile and support a very specific group of people that are engaged in your business, or that you are dedicated to helping. People connect to the stories of the individual better than to a faceless larger group, so find stories that people can relate to and tell those. Bonne Maman “Intense” – a promise of more of what you love and less of what you don’t. Sugar is the “big bad” that consumers are fighting these days. While many companies are removing sugar, retaining sweetness by adding stevia or leveraging sugar alcohols, you run the risk of starting to look over-processed and containing “not real” ingredients. And what product doesn’t make you think “wholesome sugary goodness” like a jar of jam. Bonne Maman tackled the sugar problem in an unconventional way (i.e. they didn’t turn to the obvious sugar alcohol solution). Instead, they dialed up what people love – the fruit flavor. The result is “Intense” – a promise of more of what you love and less of what you don’t. As someone who’s taken a hiatus from jam at home due to the sugar, I’m intrigued to give it a try. Remember to take a different perspective. Try a different way to solve the problem instead of the tried and true. If you have to cut back, what can you amp up at the same time? Nobody wants to live in a state of deprivation. Telling people – “Hey! There’s less sugar in this jam” may sound healthier, but it’s not really promising much on taste. But saying “We put in more of the good stuff – the fruit – and managed to take out some of the sugar” – now that’s promising an improved, possibly indulgent experience. 3) Esoteric Packaging - It’s Pretty, But What’s Inside? 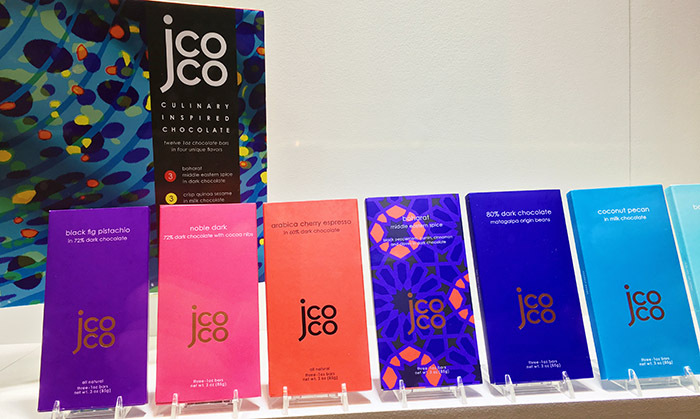 J CoCo chocolates gorgeous new package - but what exactly is inside? Several years ago at Fancy Food, we sat in on a great presentation on food trends by Culinary Tides. The argument is that there is a strong link between culinary trends and the state of the economy. Comfort food in times of hardship. When the economy has a stronger and longer boom, molecular gastronomy became more prevalent. Whimsical, eccentric and esoteric, this is food that’s furthest away from function. Of course you eat it but it’s also art. The experience means as much as the nutrition, while comfort food is all about the nurturing of body and soul. I’ve come to suspect these rules hold true with packaging as well. Walking around, it was evident that there is a rise in more esoteric packaging. Beautiful to look at it, like a gift, but you may not know exactly what the product is inside. I saw the first one shortly after arrival. A new exhibitor at the show, offering delicious shortbread crème sandwiches with a wide range of global flavors. Looking at the packaging though, I wasn’t sure what the product was. Perhaps it was my eyes. I took a second look. There was a beautiful illustration representing the geographic location of the flavor – but I wasn’t sure what was inside. And if you put a cigar on a package – it says “smoky, burnt, ashes” not fantastic shortbread cremes. J CoCo chocolates also had a gorgeous new package. Solid bright colors but no indication of what was inside. It was shaped similarly to other large premium chocolate bars. Perhaps in context in a retail environment I’d make an assumption of what it was. The reality is that shoppers spend a handful of seconds making decisions on every purchase. Will this packaging make the sale in that time? Can your business afford that? The J CoCo package actually contained 3 smaller mini-bars, a great innovation to help manage your consumption of the bar. I only realized this when I saw the product at the booth, open and on display. How will that translate at the retail shelf? The bottles in the above photo are beautiful, who wouldn’t want them on their counter. They could be anything however, syrups, oil, or, what they are clearly labeled, “balsamic vinegar.” Communicating what’s inside while still delivering a wow with the bottle. Striking packaging draws attention at shelf and you need to give yourself every edge that you can. In that quest to stand out, don’t forget the packaging fundamentals – communicate what your product is, why people should buy it and what the benefit it. If all you have is a pretty package, that’s not very compelling – Tiffany blue boxes excluded of course. This is a tough road to travel in the US – bugs have an inherent “ick” factor in our culture. Yet entrepreneurs are determined to keep trying – insects are much more sustainably raised and less resource reliant than other forms of protein. Don Bugito is putting the crickets and meal worms into products, and not always in ground up form. To be honest, the Chili Lime Crickets (with pumpkin seeds) that I tried had a delicious chili lime seasoning and I couldn’t taste the crickets at all. Honest! While bugs you can see aren’t that appetizing. The invisible, good-flora-in-your-gut bugs that drive overall health, now that’s something people are clamoring for and entrepreneurs are happy to deliver. One standout that we tried was Fizz, a probiotic lemonade with flavors like ginger and lime. And we have to give a nod to all the Apple Cider Vinegars that were present. How are you “zigging” when everyone else is zagging? What did you see at the show that we might have missed? Let us know. Contact us at hello@ignite-360.com or join the conversation on Facebook, LinkedIn or Instagram.